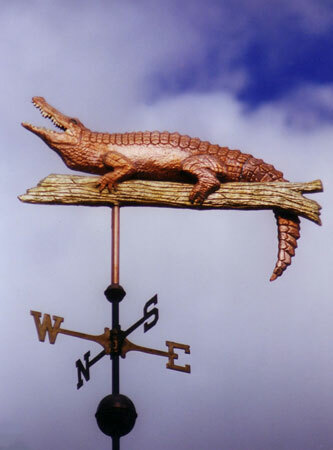 The Alligator Weather Vane, Alligator mississippiensis, featured here consists of a copper reptile and brass log. The teeth were done with optional gold leaf. As the weathervane ages and starts to patina, the teeth will stay a shiny golden color as the copper and brass gradually become a deep chocolate brown and eventually turn green. The glass eyes were custom made for this weather vane and feature vertical black slits. They give it a very life like appearance. While this particular sculpture piece was made as a weathervane, it is also interesting in a pond or pool at water level. When the wind blows, it slowly turns in the water, giving the casual observer quite a start when they see it! There are two living alligator species: the American alligator, Alligator mississippiensis, and the Chinese alligator, Alligator sinensis. In addition, several extinct species of alligator are known from fossil remains. Alligators first appeared during the Oligocene epoch about 37 million years ago. American alligators live in freshwater environments, such as ponds, marshes, wetlands, rivers, lakes, and swamps, as well as in brackish environments. When they construct gator holes in the wetlands, they increase plant diversity and also provide habitat for other animals during drought periods. They are therefore considered an important species for maintaining ecological diversity in wetlands. Further west, in Louisiana, heavy grazing by nutria and muskrat are causing severe damage to coastal wetlands. Large alligators feed extensively on nutria, and provide a vital ecological service by reducing nutria numbers.